Not choosing actors for parts. Not fishing with thin lines and flies. Not throwing things. Casting and molding class today, a different class at the museum school. I loved the teacher, we did interesting and exciting things, and this is the first thing I made. It reminded me of pressing shells and sticks into sand and pouring plaster into it. I think I made a dragon that way. It was lovely. 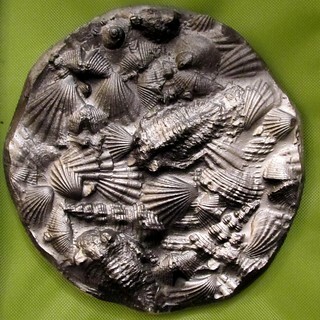 This was pressing a lot of fossils and modern shells into clay, and then making a mold of it. I like the way things overlap. You can see two trilobites, and a lot of coiled shells and several brachiopod impressions. I felt so odd from napping and waking up badly that even though I made a circle it was very ugly.